The Absent-Minded Muse: Does your ebook come with a personalized dedication? Does your ebook come with a personalized dedication? There's something special about a book signed by the author, especially when he or she writes it to you specifically. I've been thinking about whether there is a way to sign copies of Savage Fire, and I have come up with a way. 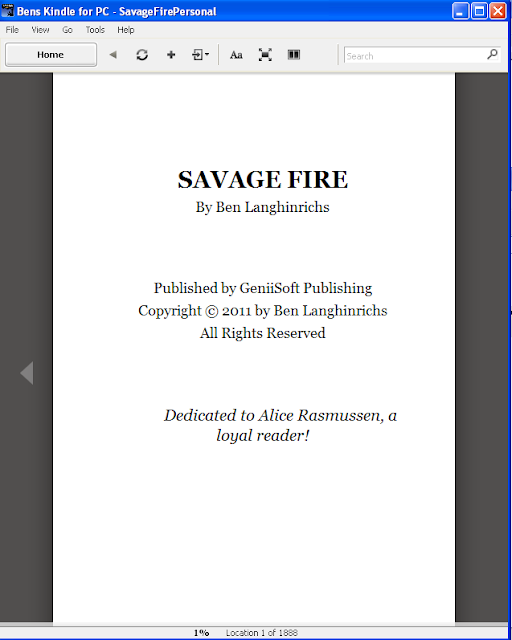 If you buy a copy of Savage Fire through this blog, you can specify the format you want for the ebook, and also a name to be used to personally dedicate the book. For example, imagine that Alice Rasmussen (a purely fictional character, not meant to be any specific individual) wants to buy a copy dedicated to herself. Alice has a Kindle, so she picks the Kindle format and writes her name in the text box, "Alice Rasmussen", and then clicks on the Buy Now button and pays with her Visa card. About an hour later, Alice notices in her mail that the personalized copy has arrived. She opens it with her Kindle for PC application, and sees the following as the first page that appears. Alice is so excited, she orders another copy, this one dedicated to her father, Frank Rasmussen. She then sends it to him as a late Father's Day gift.